Growth Projects – work on these until our next large group meeting. Read Scripture – Exodus 33:12—34:10; Psalm 19 & 145. Read – Chapter 2 in Wayne Grudem’s Christian Beliefs on God’s character. Write – a prayer of praise to God, weaving in the attributes that stand out to you. Read – Paul Tripp’s chapter 3 “Ministry” in his book Awe. Application: Take a fresh look at your life in relation to stewardship and God’s priorities. Are there any changes or new goals you would like to make regarding your time, money, or use of abilities? For deeper study in Grudem, read Bible Doctrine chapter 4 and 5 on God’s Attributes. Order book HERE. 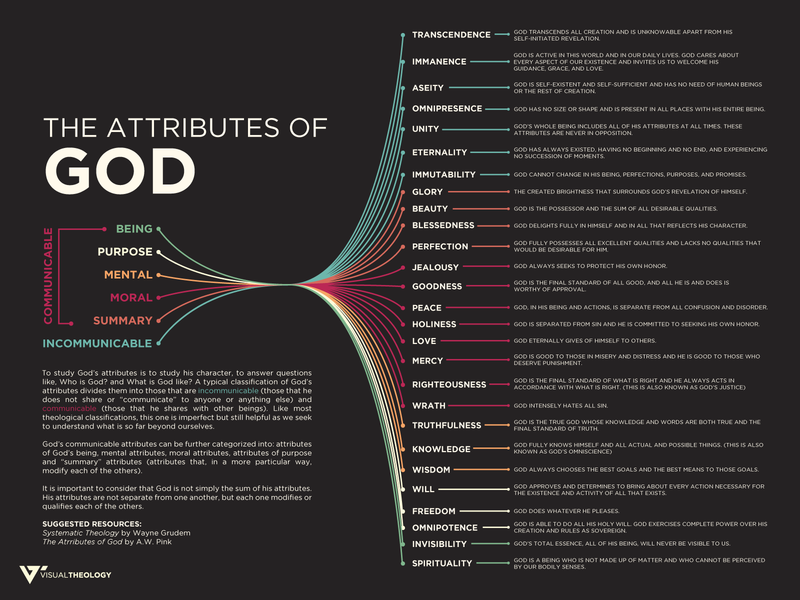 Helpful free graphic from Visual Theology.